Carnival Corp. and the Cruise Lines International Association met with diplomats and tourism officials from throughout the Caribbean and South and Central America to emphasize the strong ties between cruise lines and the destinations their ships visit. In the first event of its kind, the breakfast meeting in Washington D.C. highlighted the cruise industry’s considerable economic contributions to many destinations in that part of the world. 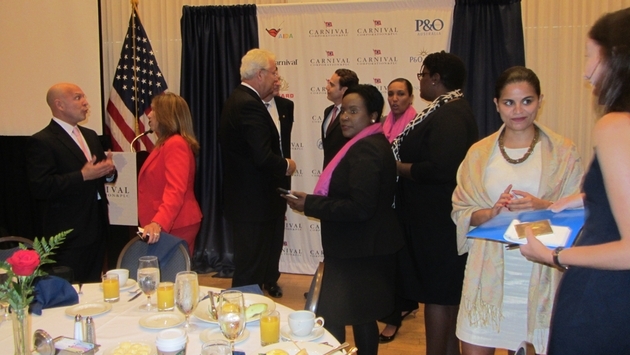 The function was hosted by Tom Dow, Carnival Corp.’s vice president-public affairs. CLIA President and CEO Christine Duffy gave an overview of the cruise industry’s economic impact — direct spending in the U.S. by lines, passengers and crew members doubled to $20 billion since 2000 — and prospects for continued growth. David Candib, vice president-development and operations for Carnival Corp.’s Global Port and Destination Development Group, updated attendees about the company’s various projects in the Caribbean, Central America, Spain and the U.S. 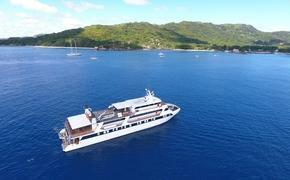 The next project to open to cruise passengers will be Amber Cove in Puerto Plata, Dominican Republic. The $85 million cruise center, which is expected to open next year, will have a two-berth pier, welcome center, recreational area with pool, a marketplace for local crafts and souvenirs, restaurants and a transportation hub. The project is in advanced construction now, Candib said. When complete, it will rejuvenate tourism in the Puerto Plata area as much recent development on the Dominican Republic has centered on Punta Cana. In fact, Candib said, the last cruise ship to regularly call at Puerto Plata was the 10,328-ton, 460-passenger Bohème, back in the 1980s, when it operated for now-defunct Commodore Cruise Line. “Amber Cove is not the destination, Puerto Plata is,” Candib said, noting the history and culture of the town, as well as the area’s “breathtaking” scenery. Carnival Corp. also has signed a letter of intent for a $70 million development on Tortuga Island on Haiti’s north coast, about five miles from Port de Paix. The facility will include a two-ship pier, a welcome center and craft market. What else will be included is still under study, but shore excursions might feature forts and sustainable farms on the island, which has a population of about 40,000, Candib said. Tortuga Island also was “the original pirate island,” he added, so pirate themes are likely. The diplomats and tourism officials in attendance appeared impressed by the extent of Carnival’s investment in many destinations. Roman Macaya, ambassador of Costa Rica, said his office is working to increase tourism to the popular Central American nation and found the presentation helpful. “I wanted to understand, given the tremendous growth in the cruise industry, what we need to do to get more tourists to arrive by cruise ship,” Macaya told Travel Pulse. Jorge Durán, chief of the secretariat for the Organization of American States who is active on the inter-American committee on ports, said he is sure the diplomats appreciated hearing about Carnival’s investments in tourism developments. “These people are crucial in making certain this information is passed on to the right individuals in their countries,” he said.